2015 August 23: Giveaway Opportunity! Back-to-School with Stationery Studio! Giveaway Opportunity! The school year is here! Even though I am actually still enjoying the last couple weeks of Summer vacation…I have to admit it is here! But, one thing I really love is coming up with back-to-school ideas, gift ideas or ways to be more organized. Stationery Studio makes finding gifts and being organized an easy task this school year! As a Homeschool Mom, staying organized is a real necessity for me and also for my family! I imagine it is important for all parents! 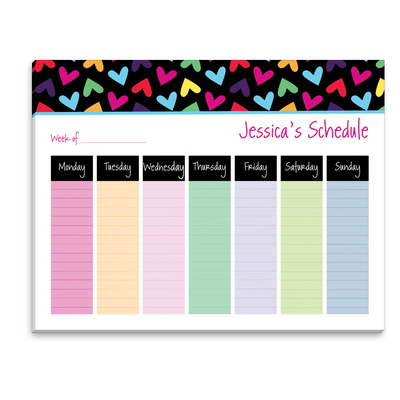 The Rainbow Hearts Weekly Schedule Pad is a great way to stay organized! I love this eye-catching, adorable weekly schedule pad! It is a pad of 50 sheets (11″ x 8.5″) and the pad is a real must-have in staying organized! The wording “week of…” is on each page. This has really become my favorite new way to stay organized for the upcoming school year! Retails for $27.00. I think everyone in the house needs one of these! Are you looking for a great gift idea? I think this one would make a great gift for a college student! The Design Your Own Natural Scent Soap is a must-buy! It’s simply a beautiful gift that will add style to a bathroom. The triple-milled, 100% vegetable-based warm white soaps are manufactured and handcrafted in Vermont. I love the gentle scent and that the gift set comes in a keepsake box. You can personalize with your choice of monogram, single initial, name or a short phrase. Retails for $30.00. This gift is also perfect for a variety of different occasions such as weddings, housewarming and many more. For these two products and many other great suggestions, check out Stationery Studio. We have teamed up for a Back-to-School Giveaway! One winner will win a $50 e-cert to use online at the Stationery Studio. To enter, visit the website and leave us a comment below telling us one of your favorite items for back-to-school! Deadline to enter is September 1st, 2015 at noon PST. One winner will randomly be selected via Random.org. Self Disclosure: I received free product samples to facilitate this back-to-school post. No other compensation was received. Photo Credit: Stationery Studio. 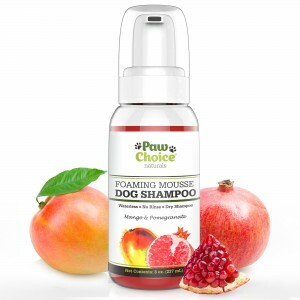 Dry Dog Shampoo by Paw Choice is a Must-Have! 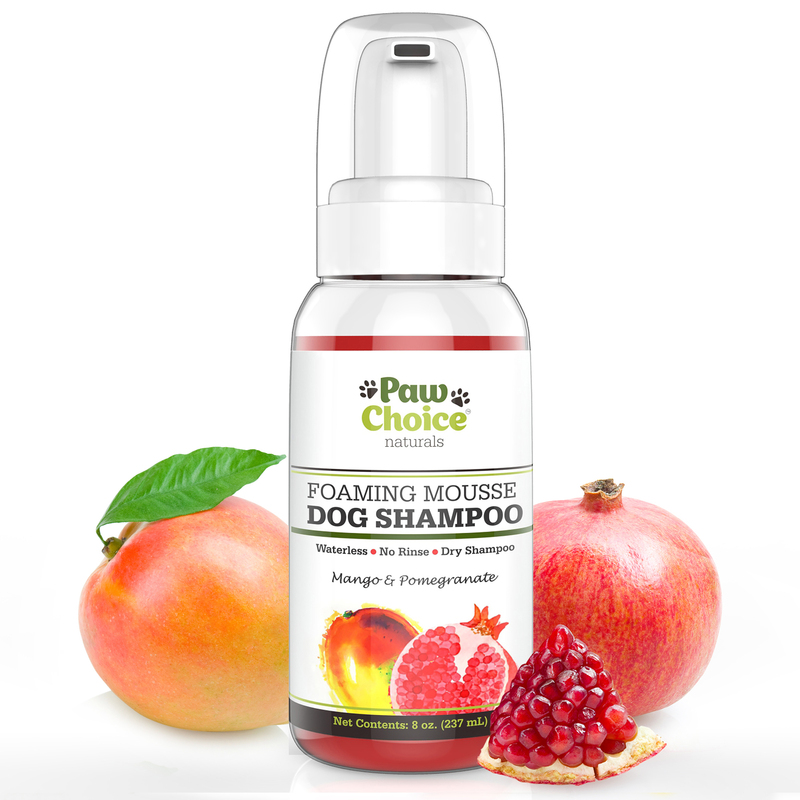 Great for dogs who don't like baths! I really like this dry dog shampoo! It smells really good (mango & pomegranate scent) and I like that it is gentle and safe. My pup isn’t crazy about baths so this is great for in-between baths. I like that it natural and water-less. My pup also tends to have dryer skin during the summer months so I really like that this one does not dry out his skin. It’s super easy to use and basically is a great way to keep my pup smelling good. 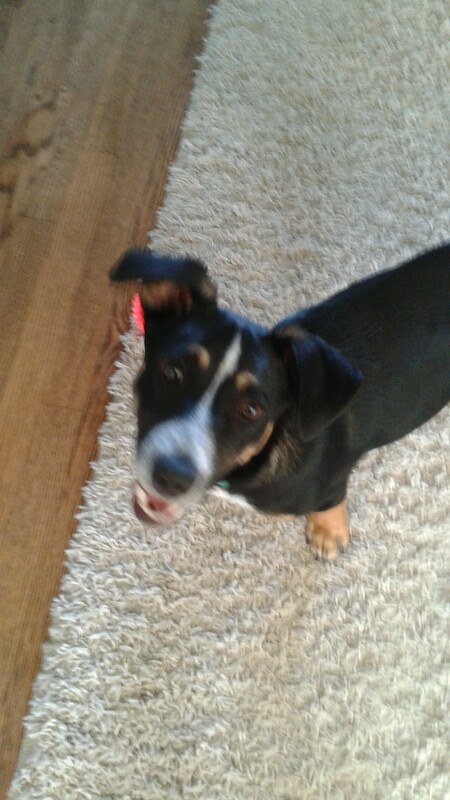 My pup is a happy pup too! He is happy that there is no bath tub involved! The story is set in a Valley. However, it is a post-apocalyptic time. The area outside of the Valley is completely covered in radiation,but somehow the valley is clean. At the moment, only one girl lives there. However, two more men join her at her farm, and soon friendship takes an unexpected turn. If you would like to find out what happens, you have to see the film. My favorite scene is when one of the men arrives and he already is rather friendly with the main female character. They just accomplished something big and they decide to have a bit of fun. The girl dresses up the dog and it is one of the few funny scenes. I like how it shows people that even after the worst possible things, we can still have fun and laugh. Honestly this film is rather mature and it’s a drama. So, I recommend it for ages 12 to18. Kids this age could appreciate the story and the concept of this thought-provoking film better than younger ages. 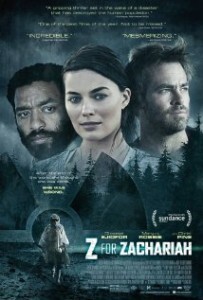 I give this film four out of five stars because, although the film has wonderful acting and directing, I think the story was a bit incomplete and some scenes were stretched out which made it a bit boring. This film is in theaters on August 28 so, if you’re a sci-fi fan, put it on your list. 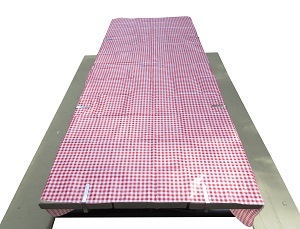 Harvey’s Picnic Table Cloth is a Real Must-Have this Summer! Summer time means BBQs and picnics! Harvey’s Picnic Table Cloth is a real must-have this Summer! It is made from vinyl and can be used indoors and outdoors. I really like the gingham (red and white checkered) pattern. But, most of all I like that it is reusable, easy to clean and that there are 6 cloth clamps that are included. Where I live, even though it is sunny, it often gets quite breezy so keeping a table cloth on an outside table can be quite difficult. But, with this table cloth, there is no longer that issue! The clamps work really well and are super easy to use! Self Disclosure: I received this product fro free in exchange for an unbiased review. No other compensation was received. 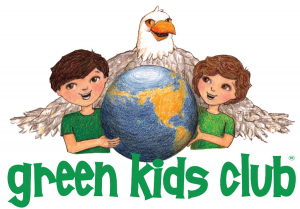 Your kids can even become a official Green Kid! Self Disclosure: I received a free copy of a picture book to facilitate this post. No other compensation was received.